Welcome back to the Commander Showdown, the series where we pit similar-ish commanders against each other to analyze differences in card selection and strategy. Normally, I like to analyze two commanders at a time, such as Jodah vs Ramos‘s five-color face-off, or Marath vs Ghave‘s counter-token-combo matchup. However, this week we’re discussing not just two, not just three, but four commanders at once! This Showdown received so many votes that it would have been criminal to ignore. This week, we’re taking a close look at the family of land-based commanders: Omnath, Locus of Rage vs Karametra, God of Harvests vs The Gitrog Monster vs the new Tatyova, Benthic Druid. Green loves lands, but when paired with each of the four other colors, that love manifests itself in very different ways. Omnath gives you creatures for each of your lands, while Karamtra gives you lands for each of your creatures. Gitrog draws you cards when your lands leave the battlefield, but Tatyova draws you cards when they first arrive. How do these four Landfall-manders compare to each other? How does each color affect green’s natural strategies? Buckle up for a Landfall Battle Royale! Naturally, these cards are all green, to fit into all four decks. As expected, we see famous Landfall cards like Avenger of Zendikar littering the list. However, right off the bat, we notice something totally crazy: there are only three cards that qualify as Top or Signature Cards for all four commanders: Exploration, Rampaging Baloths, and the aforementioned Avenger of Zendikar. When I first arranged this diagram, that was not the result I expected. I genuinely anticipated an All column full to the brim with Kodama’s Reaches and Oracle of Mul Dayas, but that’s not the result we got. 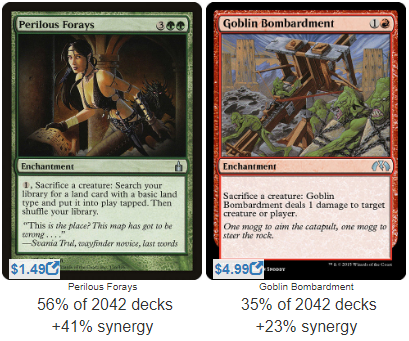 There’s a respectable number of cards in the Three column, which show up as super-popular cards for three of these four commanders, but there’s a much smaller overlap than I had expected. Many of these cards do show up on all four commanders’ EDHREC pages, but they aren’t all quite popular enough to be Top and Signature Cards for each of them. What’s going on here? One of these charts is not like the other. While the other commanders run an average of 40 lands and 22 creatures, Karametra runs 37 lands and 32 creatures, a full ten creatures more than her counterparts. Not only that, she also tends to run a significant number of enchantments, with an average of 14. Her deck makeup is, at its very foundation, distinct from the other commanders. We’ll get to more of Karametra’s specifics a little later, but all of this is important to help interpret that first Venn Diagram above. 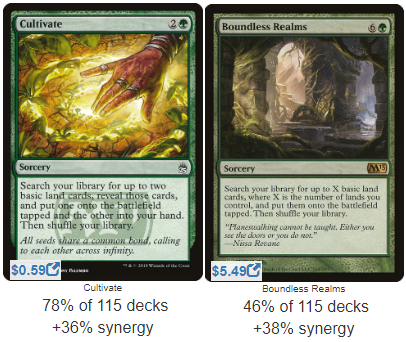 There are a lot of commonalities for mono-green Landfall cards across all these decks, but one commander has such a core difference that it tilts the way the diagrams look. Speaking of, let’s get to the second part of the Venn Daigram: the cards these commanders don’t have in common. These are the Top and Signature Cards that don’t have any overlap at all, and this is where we start to find our best data. Each column has cards the others can’t play (no red Warstorm Surge in a blue-green Tatyova deck, for example). It’s therefore extra-important to focus on the green cards, which could be played in each deck, but remain distinct. I’ll go through each commander and their specific column one by one. Omnath, Locus of Rage didn’t become the #1 Gruul commander by accident. He creates a 5/5 Elemental for each land that hits your field, and throws Lightning Bolts at people if his precious Elementals die. The angry green jelly bean doesn’t mess around, and his column proves it. Zendikar’s Roil helps Omnath duplicate his Elemental output. Even though the Roil tokens are only 2/2s, Omnath will still deal damage if they die, so making more is key. Players have taken advantage not only of the tokens’ creature types, but also their base power. Warstorm Surge and Where Ancients Tread deal damage based on the inherent stats of Omnath’s tokens, but we also see Elemental Bond, which uses those stats not only to deal damage but also to keep your hand full. Rishkar’s Expertise operates in a similar vein, and Traverse the Outlands turns your natural power into yet more resources! That’s one of my favorite things about Magic: the Gathering players; from creature type to color to power and toughness, we learn to use all possible details of a card to eke out every advantage. I think Omnath is giving us a very important signal with these specific cards. Omnath looks at lands through the lens of power. Like Saskia the Unyielding, he is militant and aggressive, and of the four Landfall-manders, he’s the one that will be attacking. Unlike most other aggro commanders, he’s able to be this aggressive because it’s so easy for him to amass an army. Other token decks must cast spells to make creatures, but Omnath’s lands make creatures, so he gets to keep his spells for other purposes. This gives him an inherent leg up on card advantage. As a result, his army can be more aggressive because they’re more expendable. Omnath will even run sacrifice outlets to turn his creatures into those last few points of damage, such as Goblin Bombardment and Perilous Forays. We have time for one more important observation about Omnath. His column contains some unique cards that shouldn’t be so unique: Terramorphic Expanse and Evolving Wilds. 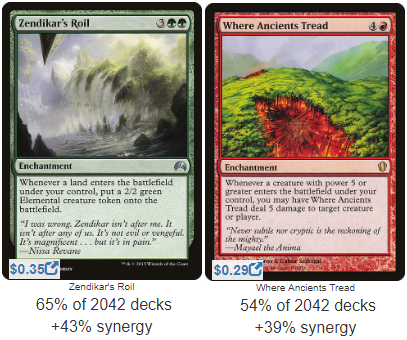 These should be staples in any Landfall deck, but they only appear in Omnath’s column. Why? The reason, I think, is twofold. First, Omnath’s access to red gives him the greatest damage output from out of nowhere, such as with Warstorm Surge or Fires of Yavimaya. Those both allow your creatures to deal damage the turn they appear, which makes double-land drops extra important to Omnath, attacking your opponents with a ton of damage they didn’t anticipate. Second, Omnath is the most budget-friendly of these commanders. You do not need to build Omnath with an enormous wallet for him to still be powerful. While some will tune their deck with expensive fetchlands and Doubling Seasons, Omnath can also just play a single Explosive Vegetation and smash in to cut out a fourth of someone’s life total. Evolving Wilds shows up as extra-popular for Omnath because he doesn’t necessarily need as much of an extra push from Ultra Mega Super Awesome Expensive Powerful cards to get within reach of victory. They’ll help, of course, but he simply requires less of that help than the others. Card to Consider: Kavu Lair. While this card does trigger for each player, I guarantee you’ll be making more high-power creatures than your opponents. Like Elemental Bond, this is another way to keep your tank full, which is extra valuable for this color pair. Speaking of expensive cards, The Gitrog Monster’s column is full of them, especially Crucible of Worlds. Since this big Hypnotoad draws you cards whenever your lands die, it’s no wonder that we see such a unique artifact in his column, even if it has become a very pricey piece of cardboard. I’ve written about Gitrog in a previous Commander Showdown, in which I stated that it’s one of my favorite decks because of how slippery it is. Did they wipe your Rampaging Baloths tokens? Make more with Worm Harvest and play a huge Centaur Vinecrasher. Did they exile your graveyard? Cast Exsanguinate for X=20, because you have so much mana. Since I’ve written about the big bog frog previously, I won’t linger on it too long here, but to my mind, Gitrog’s column proves that this slipperiness is still its greatest asset. 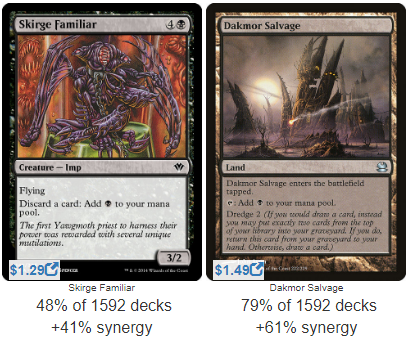 We can see cards like Skirge Familiar and Dakmor Salvage in Gitrog’s column, which combo together in a truly disgusting (and powerful) way. We also have Squandered Resources, which is just as potent. Some competitive folk might say these cards indicate that Gitrog looks at lands through the lens of combo, but I contend that he looks at them through the lens of resourcefulness. Gitrog isn’t afraid to dance on the knife’s edge and get rid of your most valuable game pieces—including the very lands that allow you to cast spells at all—in exchange for completely different pieces. Skirge Familiar is part of a combo, sure, but it’s mainly a method of transferring one resource into another. Other cards in his unique column like Sylvan Safekeeper and Realms Uncharted help demonstrate this resourcefulness even further, as they toss away your lands for additional benefit. Realms Uncharted is especially handy, since it can get you out of sticky situations. Need a ton of mana? Find Cabal Coffers. Facing down an army? Run and get Glacial Chasm. Card to Consider: Glacial Chasm. This is a very good land in any deck, but especially in Gitrog’s, where you don’t have to pay the cumulative upkeep costs because you can return the land from your graveyard so easily. Overall, Gitrog is a deeply flexible deck whose potency lies in its ability to exchange resources with alarming efficiency. As we discussed earlier, Karametra, God of Harvests has many features that make her distinct from her fellow Landfall-manders. As one of the indestructible enchantment Gods from Theros, she’ll only ever be a creature if you want her to be, which helps her dodge removal like Swords to Plowshares. Better yet, she plays like the opposite of Omnath, Locus of Rage. While he gives you creatures for each land you play, Karametra gives you lands for each creature you play. 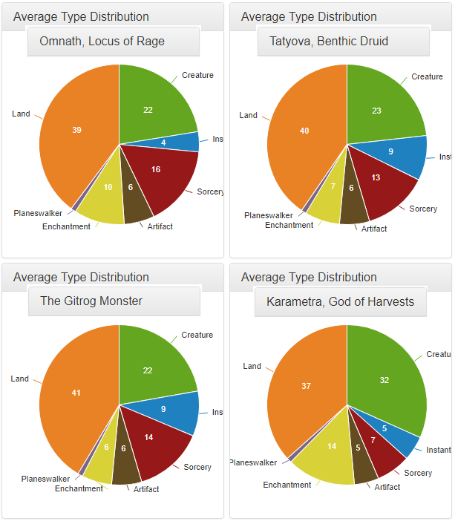 Earlier we noted a discrepancy with her pie charts—she alone of these four commanders has an average of 32 creatures. This makes sense, since her ability rewards a creature-heavy deck. Plus, if we take a look at the cards from her specific column, we can see she has some fantastic critters at her disposal. 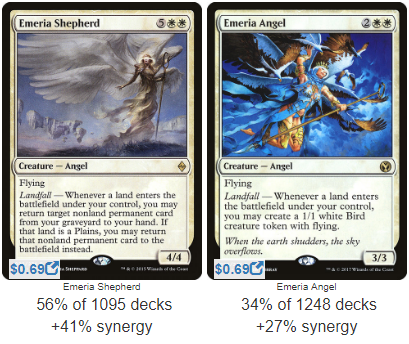 Emeria Shepherd and Emeria Angel offer a ton of value for your land drops. Casting a single Wood Elves feels so much better in her deck than anyone else’s, because it will fetch you not just one but two lands! However, the true haymaker has to be Whitemane Lion. The lion’s ability can be used to bounce itself back to your own hand. In other words, you have a repeatable Rampant Growth that you can cast at any time. Combined with a Soul of the Harvest, I’d say you’re in darn good shape. We noticed one other interesting Karametra metric, and that was the number of enchantments in her average deck. As we saw with the pie charts, she often runs about 14 enchantments, a rate that’s much higher than most other decks. 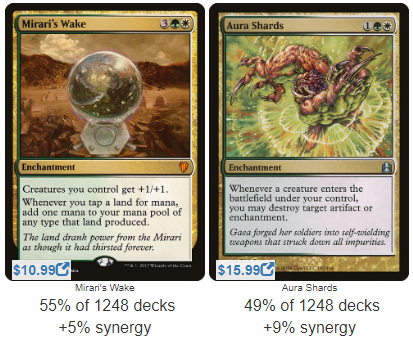 This is partly because some folks have chosen to build Karametra as an “Enchantress” instead of a Landfall deck. Powered by cards like Argothian Enchantress, Mesa Enchantress, and Enchantress’s Presence, this commander can give you more lands for each of your Enchantress creatures, not to mention trigger their abilities when you cast her, since she is herself an enchantment. Much like The Gitrog Monster, Karametra can convert one resource to another. Creatures beget lands, lands beget enchantments, enchantments beget card draw, and card draw yields more creatures. However, even without a dedicated Enchantress build, Karametra is still able to put forth some of the best enchantment cards in the format. Mirari’s Wake and Zendikar Resurgent give your crops increasingly bountiful harvests. The real cream of the crop is Aura Shards, which guarantees that you’ll be the only one with enchantments or artifacts on the field. Lastly, my attention is drawn to some exceptionally powerful creatures in Karametra’s column. 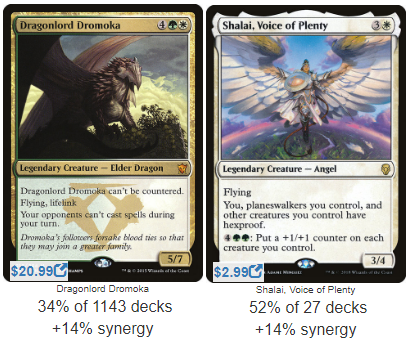 Dragonlord Dromoka, Nylea, God of the Hunt, and the new Shalai, Voice of Plenty show up in a high percentage of Karametra decks, and I think they help represent the true heart of Karametra’s strategy. With her ability, you’ll spend the game amassing tons and tons of resources, but 1/1 Bird tokens from Emeria Shepherd aren’t enough on their own. Shalai and Nylea give you a place to put all that mana you’ve accrued, turning even the smallest creatures into late-game powerhouses. Dragonlord Dromoka meanwhile reminds us that to make this strategy work, Karametra needs to keep herself and her stuff protected. Her cards and tokens aren’t as disposable as Gitrog’s or Omnath’s. From Dromoka to Grand Abolisher to Privileged Position, white allows Karametra to keep her shields up and her plans out of harm’s way. She’ll stay safe, slowly accruing value, until she’s established a good enough position in the later game to finally launch an attack, which she’ll be able to do with her metric ton of mana and her mana-sink creatures that can endlessly improve her team. In other words, Omnath and Gitrog use Landfall cards for their triggers, but Karametra uses them for the mana. She views lands through the lens of defense, building an insurmountable wall and then toppling her opponents with it. Card to Consider: Mirri, Weatherlight Duelist. This deck needs a way to close a game out once you’ve established your defenses. Mirri not only makes your opponents unable to block favorably, but she also does double-duty in the earlier parts of the game, making it impossible to attack you with more than one creature. Plus, she’s a creature, which triggers Karametra’s ability. On all fronts, Mirri is a home-run inclusion. Finally, we have Tatyova, Benthic Druid. This brand new Merfolk draws you a card and gains you a life every time a land enters the battlefield under your control. Some cards like Horn of Greed only count when you play a land, but Tatyova will trigger not only for your land drop each turn, but also for your spells that put them into play, such as Cultivate, Skyshroud Claim, or better yet, Boundless Realms. Naturally, Tatyova’s specific column was filled with cards that keep her engine flowing. Classics like Coiling Oracle and Urban Evolution will draw you more cards than their mana costs should allow. Cracking a Myriad Landscape or a Khalni Heart Expedition don’t just ramp you, but they do a good impression of a Cloudblazer. 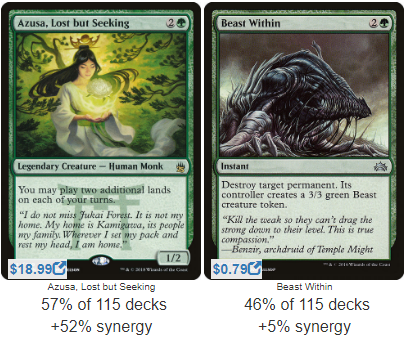 Most importantly, Azusa, Lost but Seeking lets you play tons of lands, which means even more cards, which means even more lands. It’s curious to see a pricey card like Azusa show up as a Top Card for Tatyova, but not for the other commanders. Karametra is fine without Azusa, since she wants to fetch lands more than she wants to play them. Gitrog likes Azusa plenty, but is more concerned with eating lands than anything else. Omnath could make great use of Azusa, but I think there are two reasons why she’s not more popular for him: first, he’s perfectly fine on a budget, and since Azusa has long been a pricey card, it was a low priority for players with an already functional deck; and second, Omnath can run out of gas. Playing lands from your hand is only good if you have the lands to play, and sometimes Omnath can just plain run out. Tatyova isn’t concerned about running out of cards, so Azusa is in much higher demand. Finally, I’m deeply interested in the lone Beast Within in Tatyova’s column. This card is a staple in green decks, the #5 most-played green card of all time. Why doesn’t it show up as a Top or Signature Card for the other commanders? Simply put, they have other methods of creature removal. Omnath can deal damage to any pesky creature in his way, and Gitrog and Karametra can Putrefy and Path to Exile anything they don’t like. In blue, Tatyova has powerhouse cards like Cyclonic Rift, but she has to reach a little farther to make stuff disappear permanently. Beast Within is therefore much more vital for her than for the others. We’ve known the other commanders for years already, but Tatyova only has 135 decks to her name so far, so let’s add one more! We’ve got one commander who uses lands for power, one for resourcefulness, and one for defense. Let’s take a peek at a potential decklist to get a better sense for Tatyova’s category. So. Much. Ramp. There are so many ways to draw cards in this deck it makes my head spin. In fact, I added cards like Kruphix, God of Horizons to make sure we can hold onto them all. This deck is set to draw so many cards that it could win with a Laboratory Maniac by complete accident. I gave each of the other commanders one notable card to consider, but since Tatyova is new, let’s give her the usual full five. I’ll go into a bit more detail about Tatyova’s deck and strategy while discussing those particular cards. Budoka Gardener: Omnath taught us that being powerful means going big. This little guy ramps us quick and churns out huge creatures to help demolish the opposition. Mana Breach: Gitrog taught us the value of our resources, especially when they can give us a benefit despite winding up in spaces we don’t normally desire. This enchantment will set your opponents back while giving you more opportunities for land drops. If you want to be really mean, you can also try out Overburden and Sunder. Squall Line: Karametra taught us that landfall sometimes means going back to basics. Lands don’t just enter and leave the field, they make bunches of mana! As long as Tatyova is gaining us life, we should be far ahead of our opponents, which means this spell will wreck their days while keeping us alive. Stone-Seeder Hierophant: A Lotus Cobra impersonator that can sometimes produce even more mana. Alhammarret’s Archive: Frankly, I’m shocked this only sees play in 20% of Tatyova decks so far. This is the Cinderella slipper for Tatyova; it could not be a more perfect fit. In case you hadn’t yet guessed, I think Tatyova’s taken a leaf out of everyone else’s book. She’s powerful and upfront, like Omnath; she’s resourceful and flexible, like Gitrog; and she defends herself while assembling her strategy, like Karametra. I think the main way Tatyova views land-centric cards is through the lens of evolution. As the game goes, she will only grow more intelligent, drawing you more cards than you know what to do with, but which will leave you able to adapt to any scenario. Moreover, her win conditions require consistent growth as a response to external pressure. Will you win through attrition with Mana Breach effects, or win by pumping tons of mana into a huge Gelatinous Genesis, or both? In short, Tatyova is a flexible new commander who will often have such a huge hand that she can’t help but pack a huge punch. Welcome to the gang, Taty. So, which flavor of Landfall most suits your tastes? Do you prefer Omnath, Locus of Rage’s fiery power, The Gitrog Monster’s slippery resourcefulness, Karametra, God of Harvests’s reinforced defenses, or Tatyova, Benthic Druid’s ever-growing evolution? Oh, and which commanders would you like to see in the next Commander Showdown? Breya, Etherium Shaper vs Sharuum, the Hegemon: This artificial Showdown has been the #2 vote-getter for quite some time! Can it reach #1 at last? 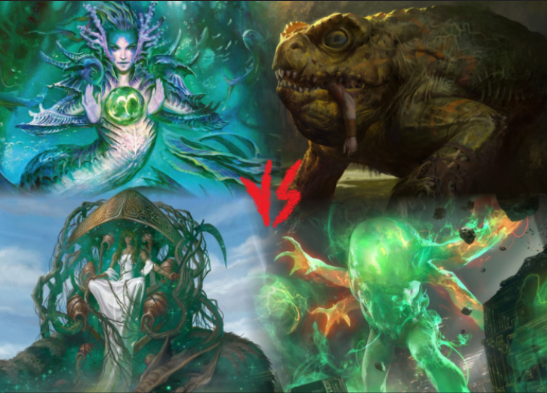 Pir, Imaginative Rascal + Toothy, Imaginary Friend vs Vorel of the Hull Clade: The new Simic partners from Battlebond against the classic Simic counter-doubler! Ezuri, Renegade Leader vs Marwyn, the Nurturer: How does the new elf legend compare to the old? Najeela, the Blade-Blossom vs General Tazri: Two tribal commanders with five-color activated abilities!